The Ronettes were a 1960s girl group from New York City, best known for their work with producer Phil Spector. 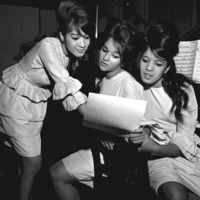 The group consisted of lead singer Veronica Bennett (later known as Ronnie Spector); her sister, Estelle Bennett; and their cousin Nedra Talley. They reached the peak of their success after releasing Presenting the Fabulous Ronettes Featuring Veronica in 1964. Some of the group's most famous songs include "Be My Baby", "Baby, I Love You", "(The Best Part Of) Breakin' Up", and "Walking In the Rain."